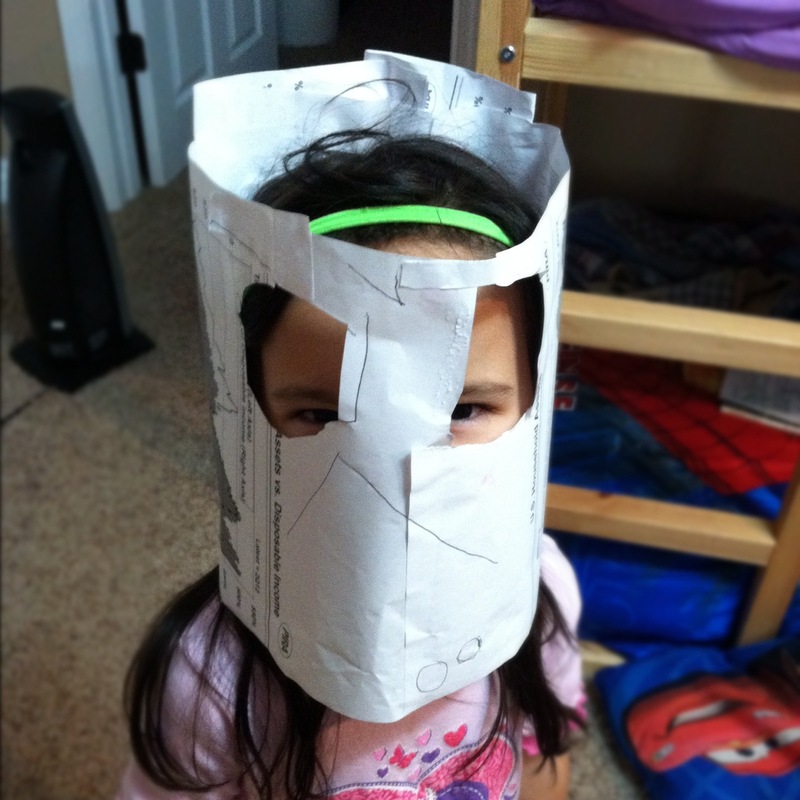 Here, Jane’s “great idea” was constructing a disguise with paper and glue. He didn’t want to go to Sunday School. “I don’t like the teachers because they talk to me like a baby,” said my friend’s 3-year old. My friend treats her kids ages 3, 1, and 6 months with more respect than I’ve seen almost any mother treat her children. She doesn’t brush them off, or baby-talk to them all day. She treats them like young people who have something interesting to say. Her 3-year old son was perceptive enough to notice when he wasn’t being treated with the respect he was used to. Did you know that our kids need our respect? We live in a culture that doesn’t value children all that much. They’re kind of annoying, inconvenient, messy little people. Why give them our undivided attention when half the time they don’t even make sense? These little people may have indiscernable accents, a small vocabulary, and know very little about life, but they are still people. They can sense being brushed off, being mocked, or treated like they know nothing. Treat them like they have nothing valuable to say, and they will grow up to be very insecure adults. Or, treat them like equals who have something intelligent to say, and watch their confidence grow. 1. Don’t mock them. As Mark Driscoll once noted, “They have little ears, but they’re functional.” A 2 or 3-year old can sense being made fun of (and can have their spirits crushed by it). Don’t laugh at their expense; you may be doing more damage than you realize. Treat them the way you like to be treated. 2. Praise their efforts. Every time you praise them for cleaning up or doing a math problem, you are giving them a token of motivation that they will be able to use in the future. If you’re stingy with your praise, your children will lack the motivation to attempt new challenges. They need affirmation as much as you do. 3. Listen to the whole story. Sometimes kids’ stories seem to go on forever. Give them the attention you’d like to have when you don’t quite have the words. Stay focused to the end. 4. Expect them to understand. They won’t always, but put the bar up there, so they can rise up to it. Use words they’re unfamiliar with on purpose. Talk to them like little adults, so they can get used to interacting with people in a mature way. 5. Engage their ideas. Our 6-year old daughter is often declaring to us that she has “a great idea!” Listen to their ideas and run with them. It may not be physically possible every time, but don’t shut down their ideas so often that they stop having them. Show them you value their creativity by employing their ideas.